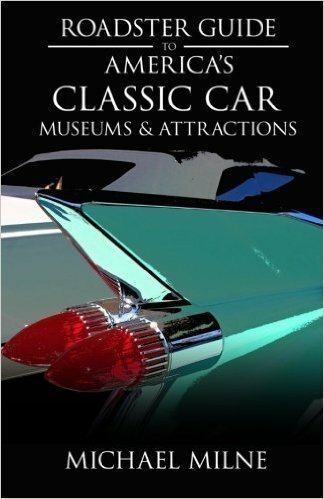 From the end of World War II through 1989, when freedom spread throughout the Iron Curtain countries, the people of Hungary were under the thumb of a communist dictatorship. 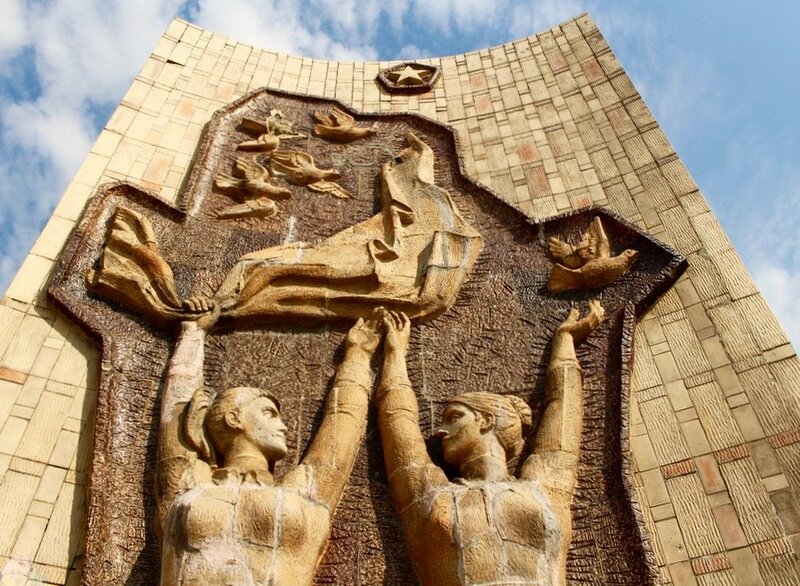 One way for the totalitarian regime to keep control was through propaganda which was demonstrated through massive statues and sculptures celebrating the “power and glory” of communism. 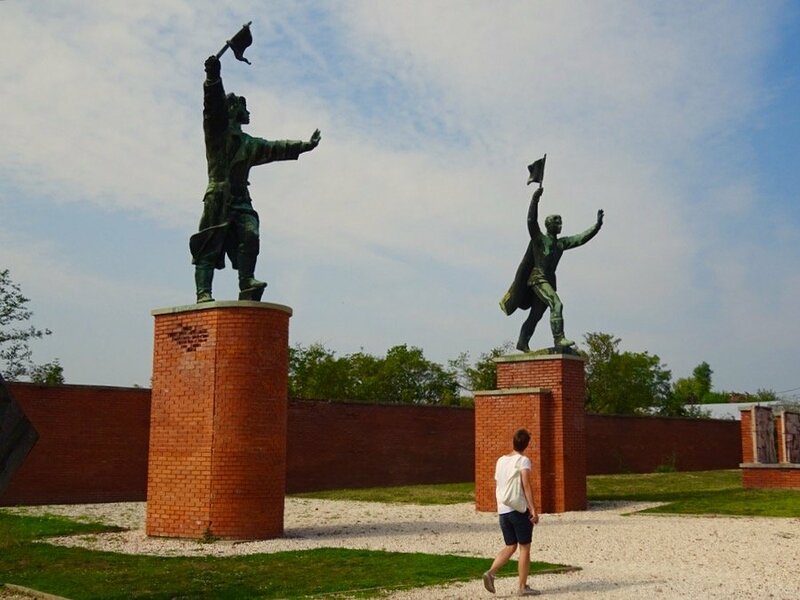 The communist statues at Memento Park in Budapest are a reminder of that era. As the Berlin Wall fell in Germany, statues of Lenin and others were torn down in Eastern Europe. In many countries they were destroyed and sent to the trash heap. 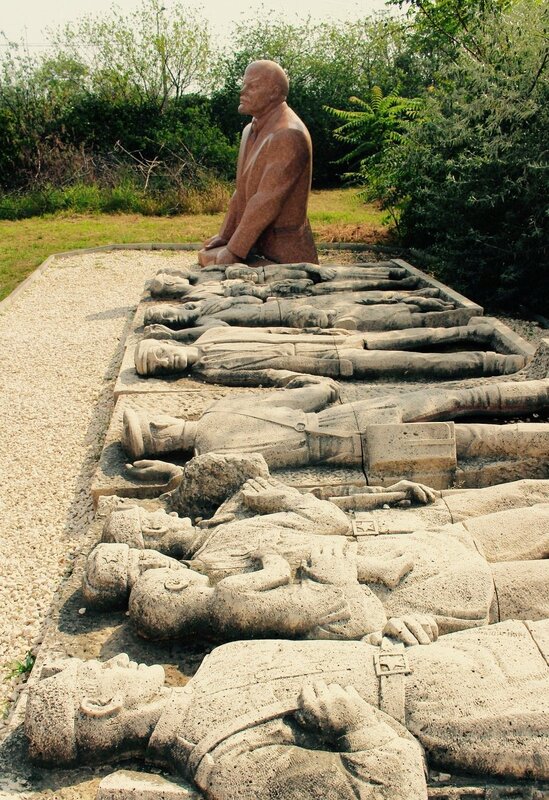 In Hungary, however, they were determined never to forget this sad era in the country’s history. 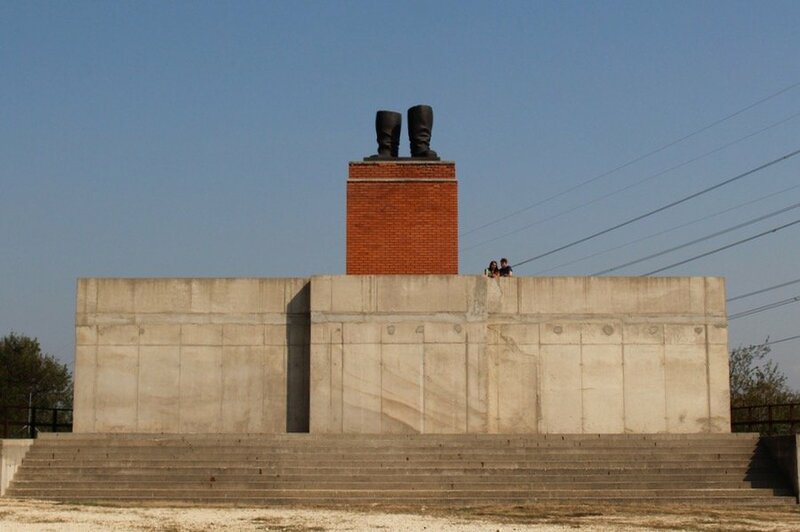 These boots belonged to a massive statue of Stalin that was town down during the October 1956 Uprising, after which only the stubborn boots remained. The remaining stand is a replica of where the party apparatchiks reviewed military parades. 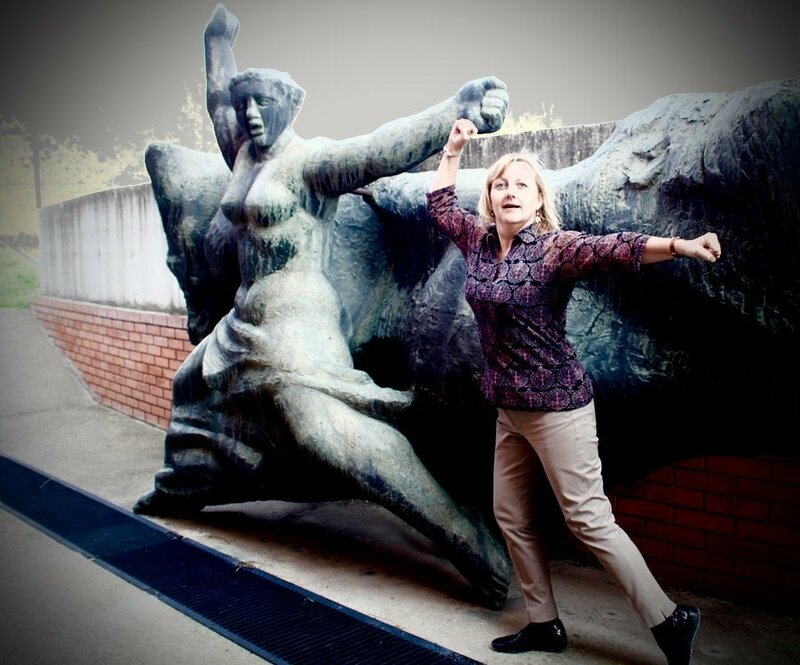 Workers’ Movement Memorial – The granite ball in this circa 1976 statue had to be replaced when the original plastic one was vandalized. 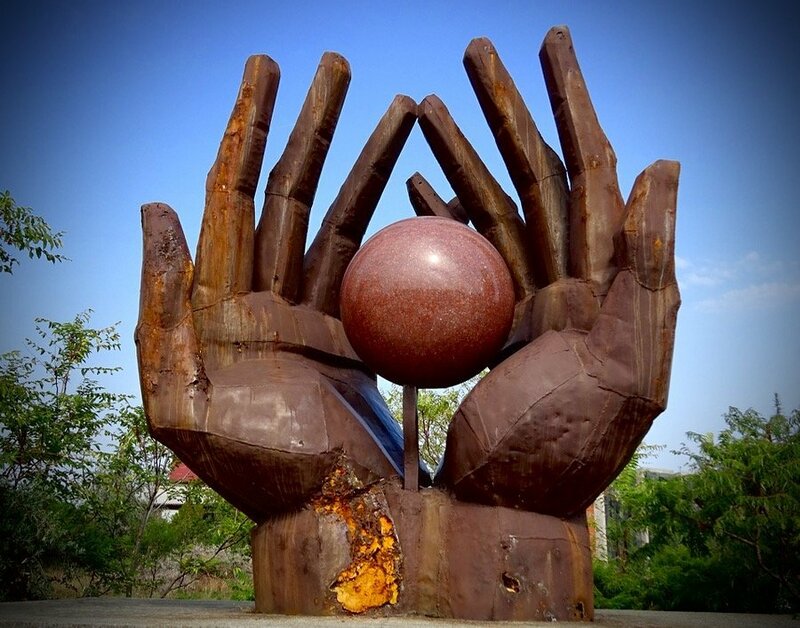 Somehow two hands cradling a ball symbolized the progress of workers under the communist regime. Lenin statue – I found this random piece of a Lenin statue along with this frieze of a soldier and the masses lying off to the side. There were so many monuments like this one scattered around Budapest. Liberating Soviet Soldier – The man strolling in front of this figure gives an idea of the larger-than-life aspect of propaganda art. 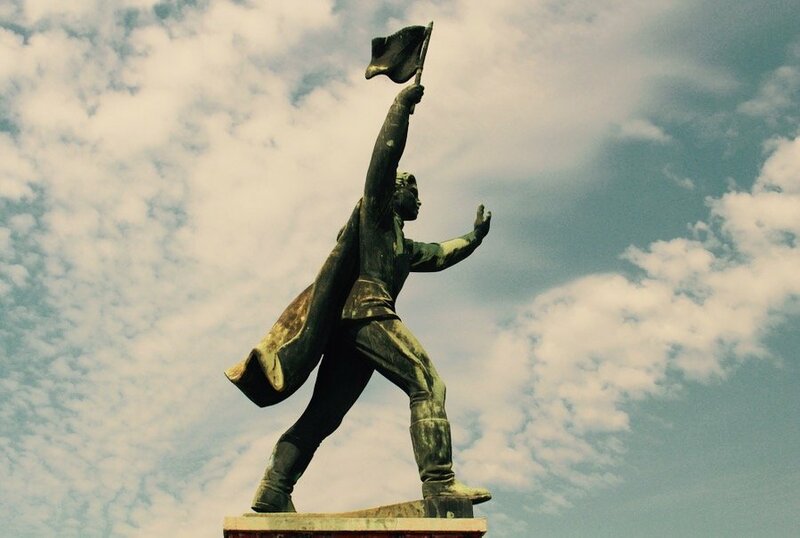 The original of this statue was damaged in the October 1956 Uprising only to be replaced two years later with this copy. 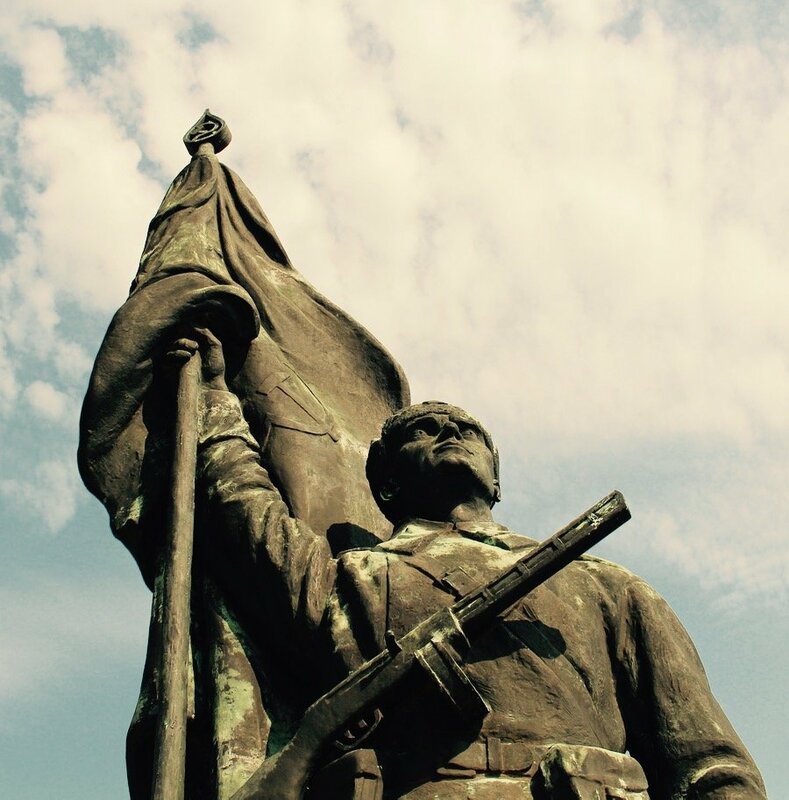 Ostapenko and Captain Steinmetz – These two statues used to man the southern entry gates to Buda and Pest and became sort of folkloric figures. 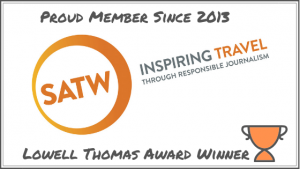 Captain Steinmetz – On his own. I’m really not sure what the cape is all about. 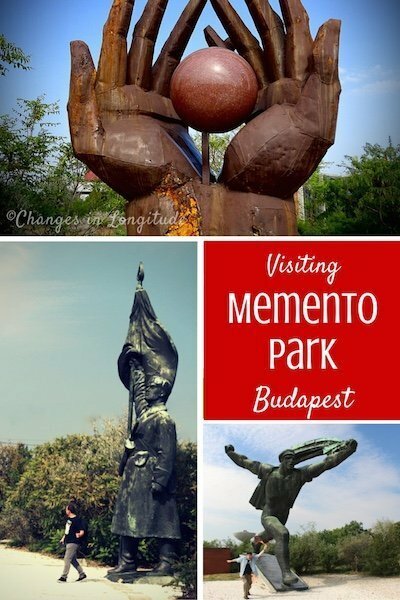 Monument to the Hungarian Socialist Republic – This dynamic sculpture is one of the most popular photo ops in the park. Local wags said he looked like a coatroom attendant running after someone who forgot their scarf. 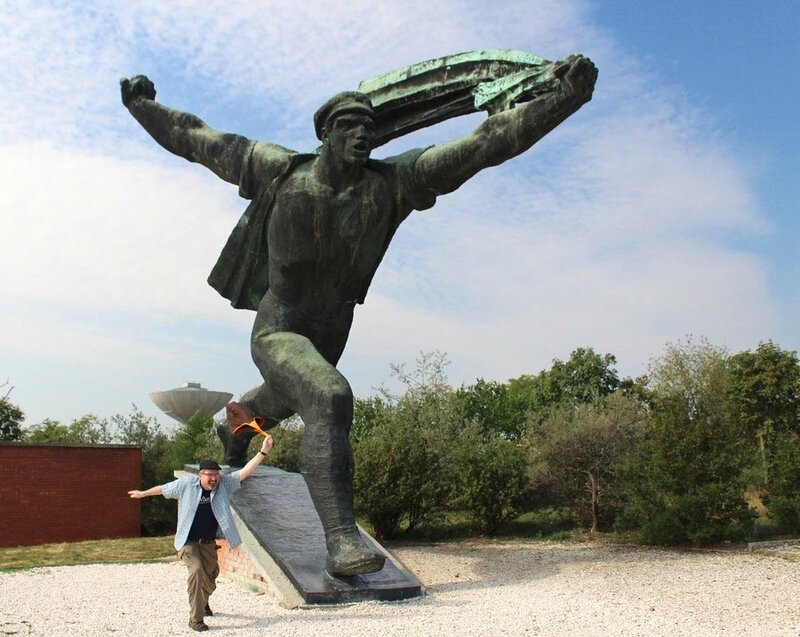 Liberating Soviet Soldier – This giant statue once occupied a prominent spot on Gellert Hill overlooking Budapest. The liberation of Budapest by the Red Army in World War II is a complicated one since the Soviet Union then proceeded to rule the country. 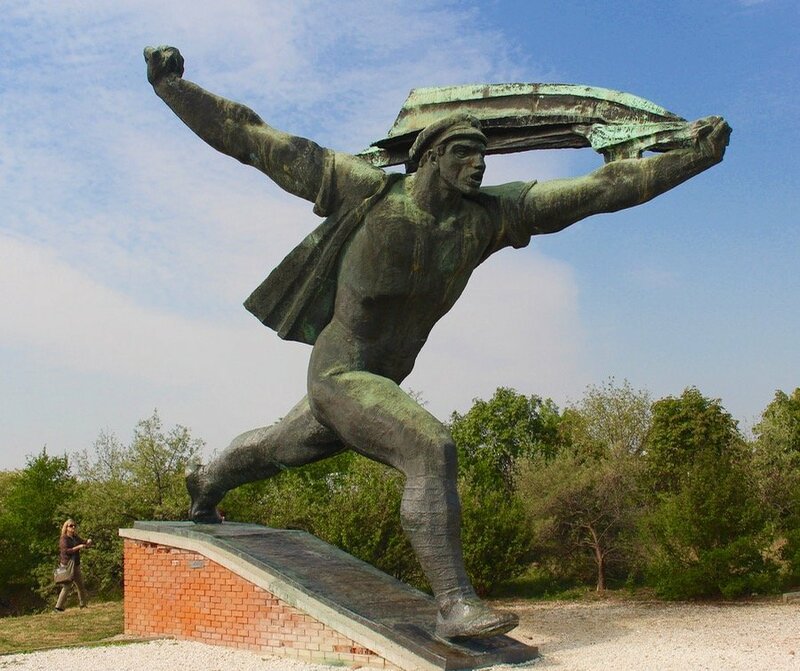 Hungarian-Soviet Friendship Memorial – Built in 1956, the irony of Hungarian-Soviet “friendship” the year of the uprising is overwhelming. 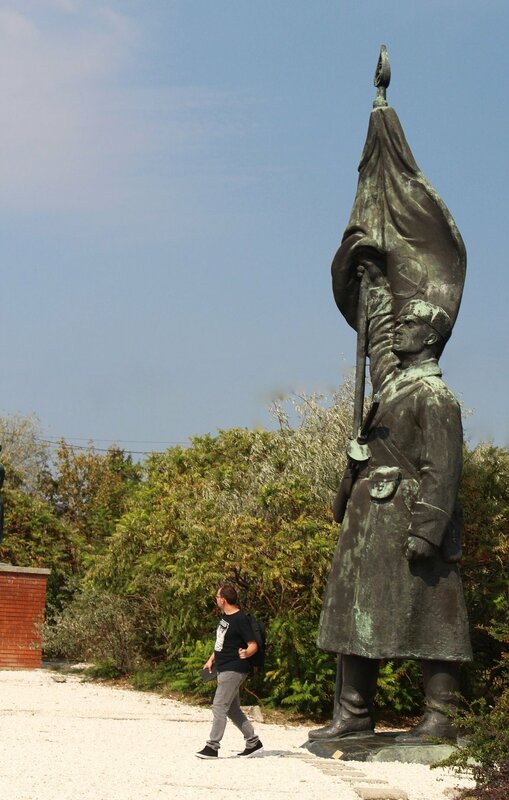 Note how the Hungarian on the left is embracing the Soviet soldier with both hands while the soldier holds one hand in reserve. 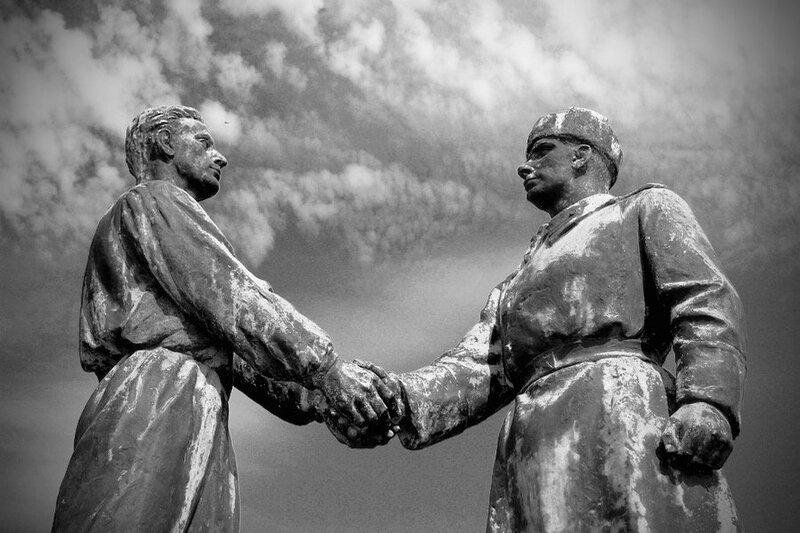 Monument to Soviet-Hungarian Friendship – This circa 1975 granite statue is yet another monument trying to perpetuate a friendship between two entities that didn’t exist. 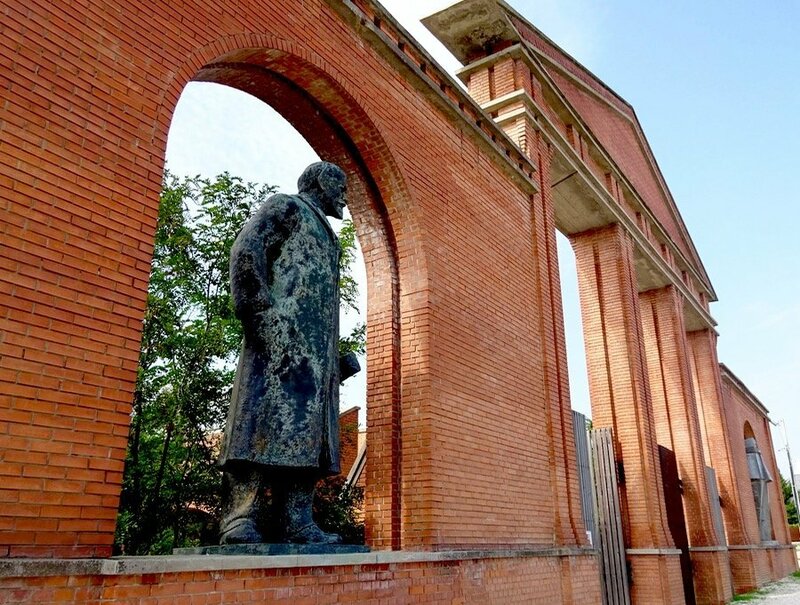 Lenin statue – This 12-foot-tall bronze statue was created in 1965 and looked prominently over Parade Square to review military parades. 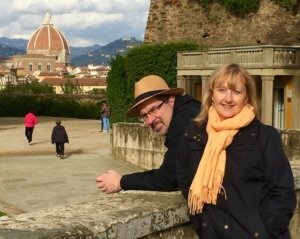 It was removed in 1988 for repairs and never made it back up to its original location due to the changing political tide. You can just see Stalin’s Boots through the entry archway. Perhaps the most sobering aspect of Memento Park is in the adjacent museum where a grainy black-and-white film is shown. It was a training film for the secret police which showed them how to spy on citizens. So much effort was spent to take away people’s freedom but in the end freedom prevailed. Okay, so it was hard for Larissa to avoid getting into the spirit of things. Address: Corner of Balatoni and Szabadkai in South Buda. (XXII District.) Take Metro #4 to its last stop at Kelenfold vasutallomas. Go up the stairs to the well-marked bus depot and take the 101 or 150 bus towards Budateteny vasutallomas (Campona). 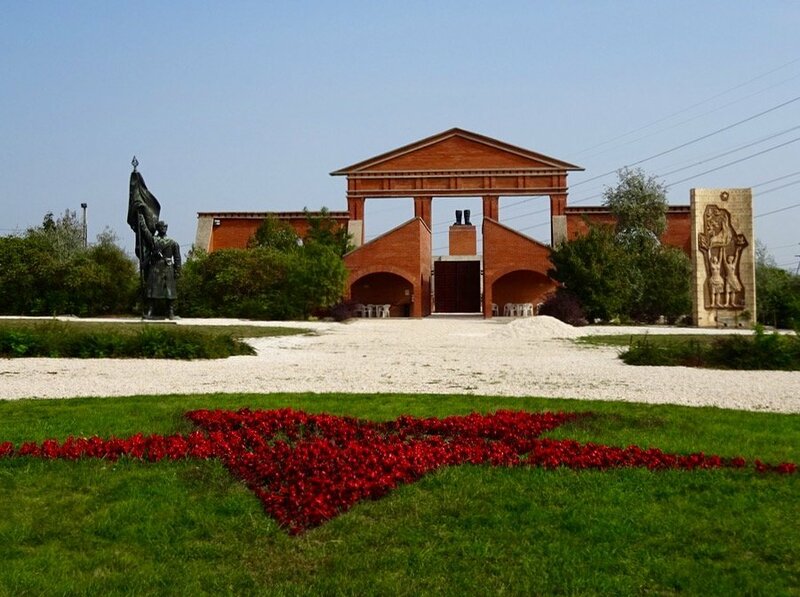 Memento Park is along the way. Look for Stalin’s boots. 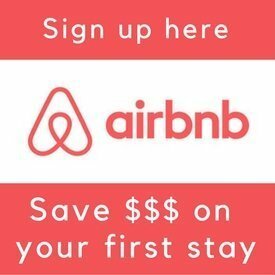 Admission: 1,500 Hungarian forints (about $5.50 USD) 10% discount with Budapest Card. Read our favorite books about Hungary.